The Internet can be a dangerous place. 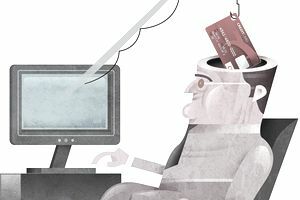 Scams abound on websites, emails, and social media. Those working at home are often prey to the scammers of the world. Knowing how to recognize work-at-home job scams is key. However, these schemes always look a little bit different, so it’s important to understand the underlying scams (which may or may not be job-related). One such example is the fake check scam. However, the check (or money order) is a very convincing fake, and it will take the victim’s bank some time to discover that the check is no good. U.S. banks are required to make funds available within a few days, but it can take weeks for a fraudulent check to be discovered. However, wire transfers happen almost immediately. So the money that has left the victims account is long gone by the time it is discovered that the check is fake. Mystery shopping—Mystery shopping can be legitimate; in fact, it often is. But there is a scam in which a check is sent to cover the cost of purchasing and returning goods, then you are supposed to wire back the money, keeping your cut. Payment processing jobs—These jobs can look very real when you apply. You are processing payments for people in other countries. You may even be asked to open a business checking account in your location, but it is in your name and you are on the hook when it is overdrawn. Lottery, sweepstakes and inheritance windfalls—You’ve won. A check arrives but the scammer asks that an amount must be sent in for taxes and fees. Seems reasonable but the check was a fake. Auction/purchase overpayment—Never accept payment for more than the agreed upon price. This is a very common way to defraud. When you refund the overpayment but keep the agreed-upon amount, later you may find out the check bounced. Rental schemes—A new roommate or tenant offers to send you the rent and then some if you forward along a payment to the movers or someone else. Guess who is left with no roommate and an overdrawn account? Reshipping jobs—This involves receiving goods to be shipped elsewhere. In addition to losing your money in these kinds of check-cashing schemes, it is possible the victim could go to jail. In reshipping scams or payment processing scams, you could actually receive the money agreed upon, but only because you are participating in money laundering and/or selling stolen goods. In money laundering, the payment might come into the victim’s account via wire or online transfer. It’s simple. Do not cash checks for people you do not know. Do not wire money to people you do not know. There are no legitimate reasons for this.